Break The Secret Code And Bust Out Your Own Booming Bass Box. 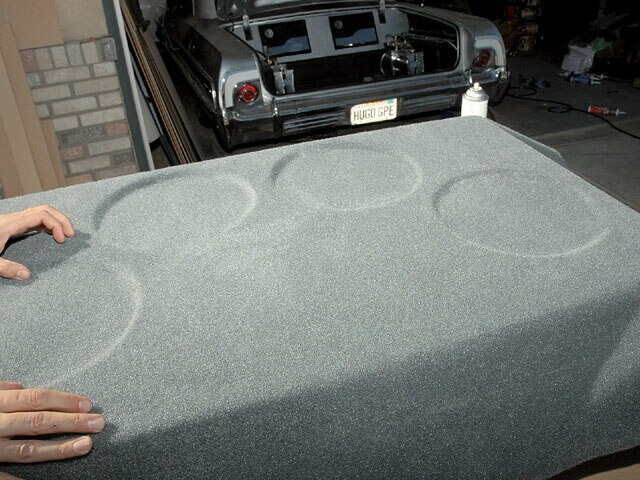 Building a speaker box is the most basic of all installation processes. There’s no magic to it, only the knowledge of the product that you’re working with. Yet every day, someone, somewhere is dishing out big bucks to get that big beat in their trunk. To help you save for that big paint job or new set of rims, we’re going to help you break the secret code and make building that big bass box as easy as changing your oil. 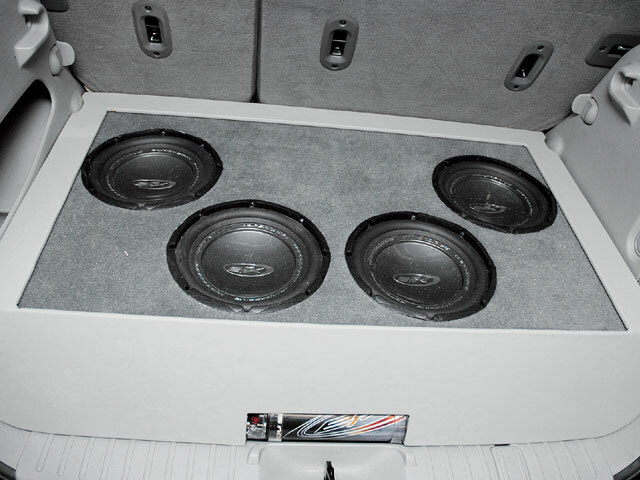 There are a few things that we look at when building a box, but most important are the areas that we have to work with and the air space requirements for the subwoofers that we would like to use. The first and foremost decision that has to be made is what you can fit in the area allowed. Beyond that, following the guidelines below should make box building easy. Calculating Air SpaceWhen a manufacturer provides you with a box dimension they typically use a box building program that takes into account the different parameters of the speaker’s characteristics. The result is recommended air space that every manufacturer will happily provide to you. The problem is that most people just don’t know how to apply this information. The typical response back to a manufacturer after they have provided the recommended air space is, “So how big is the box supposed to be?” or “Can’t you just tell the measurements?” The short answer is no. There are too many variables, like the opening of your trunk, total available height, total available width, etc. So air space can be figured with a basic algebraic equation: (height x width x depth)/1728, where the measurements are in inches and only account for the inner box dimensions (not including wood width). So in the case of 1 cubic foot box, the basic calculation would be (12 x 12 x 12)/1728. When you plug that into a calculator the final answer is 1. Additionally, you need to take into consideration the speaker displacement. The latest and greatest subwoofers are big dense monsters compared to the speakers of 10 years ago. So the displacement could go from the average .05 cubic inches to double or even triple, which will throw your total interior air space calculations way off. So read the specification sheet included with your subs carefully and take every aspect into account. There are, of course, more sophisticated and complicated ways to get the correct information, like computer programs, but these basic guidelines will help you build a decent sound enclosure. We jump right into the saw preparation. While table saw guides have improved over the years, it’s always a good idea to check the cut length so that you don’t have a board that doesn’t fit right. Take every precaution when using a table saw. Make sure that the table and board are clean so that the board doesn’t bind or get stuck in the middle of a cut. And, of course, keep your hands clear of the blade. The box was first dry fit to make sure that each of the cuts lines up as it should before attaching. Here, the side panels are air nailed into place. Each of the edges has been glued before nailing and the entire box will also be sealed with caulk before the final panel is attached. With the box sealed and nailed together we can move onto cutting out the speaker holes. Here, a pre-cut ring for 10-inch subs is used as a guide. Its slightly oversized outer diameter will aid in a evenly spacing the subs. Notice the 211/42-inch recess left on the back side of the box for the amplifiers to be sunken into and hidden from sight. 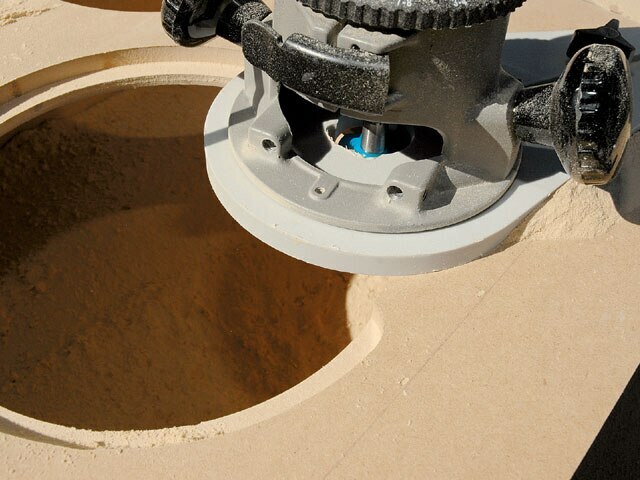 Once the general outlines are spaced out we need to find the centers of the cut outs for preparation to use our circle cutting guide router attachment. 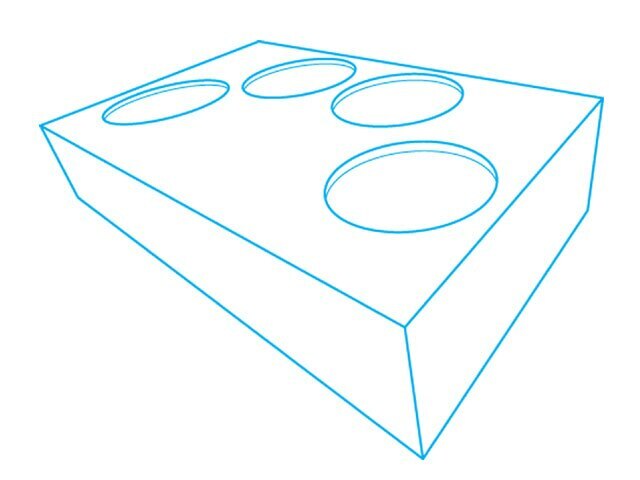 These holes can be easily cut out with a jigsaw, but for the finish we’re trying to achieve a “perfect circle” that will make things much easier. Once we’ve found the centers an 11/48-inch hole is drilled and the guide is stuck into place. We have chosen to cut in three passes. The first pass is very shallow so as to create a guide and confirm our measurements were correct. The second pass will cut deeper into the wood, making the final cut easier. The trick to the final cut is easing through the final few inches so that the finish stays true. Since the guide is in the center the end of the cut is virtually freehand. Measuring Dos and Don’tsDo . . . . take torsion bars and spare tire hold-downs into consideration. Don’t . measure beyond any bolts or curves that you can’t remove. Do . . . . take the opening that the box has to pass through into consideration. Don’t . forget that on some vehicles there may be a gas tank nearby with a sending unit that may need to be accounted for. Do . . . . take into account that hydraulic cylinders may need up to 2 inches of play on each side of a sub enclosure when a side is dropped. Don’t . forget to take into account room for the hoses to flex when the hydraulic cylinders are filled (locked up). What you’ll notice about the cuts is that they are 111/42 inch apart and 111/42 inch is, of course, the total thickness of two pieces of 31/44-inch board. So the first two cuts will be on the outside of the box and one of them will have the speaker cut out of it. The next two cuts will on the inside of one dimension, but on the outside of the other dimension. The last two cuts will be on the inside of both dimensions. Putting It All TogetherNow that you’ve calculated the dimensions and made your cuts you can dry fit all of the parts, then seal and assemble the box. 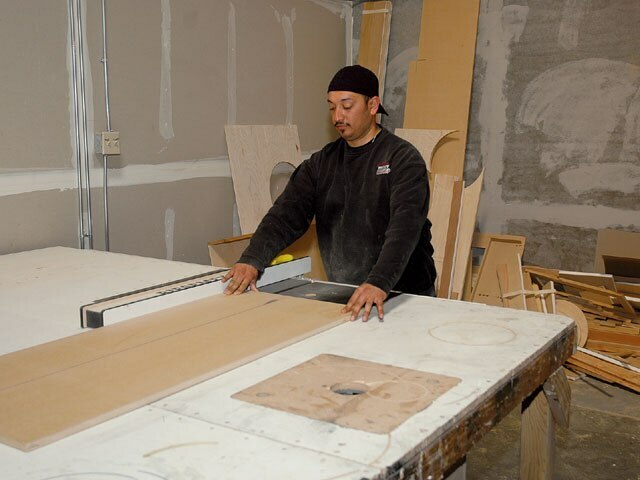 A dry fit ensures that you’ve made all of your cuts correctly before you start applying glue and screws or nails, making a fix much more difficult not to mention messy. Once everything’s confirmed you can start assembling the box. For box integrity, it’s a good idea to glue every edge before air nailing or screwing a box together. Additionally adding small braces on the inside of a box will ensure that the big bass won’t eventually vibrate the box to pieces. The final step is purely cosmetic. This is the point where you decide if you want to wrap the box in carpet, seal and mold the box for paint, or simply toss the raw wood in the trunk. Whatever you choose, make sure that the subwoofer has some type of gasket between it and whatever it’s screwed into. Most speakers have one pre-attached, but not having one will lead to a bad seal and poor sound quality. 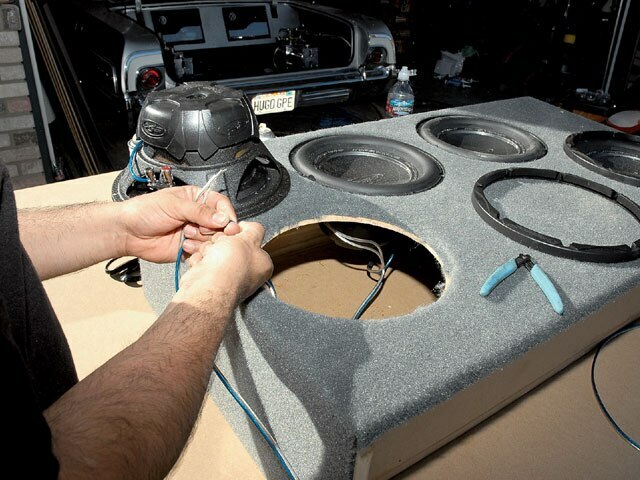 Follow along as our guide takes us through the cutting and assembly of a basic multiple subwoofer enclosure and the simple things that make the finish product look finished. Once complete the enclosure can be finished. Here, we’ve opted to carpet the enclosure. Take the time to the press the material down into the recess for good adhesion to the edges. After applying adhesive to both the material and the enclosure and allowing some cure time we can start to lay down the material. 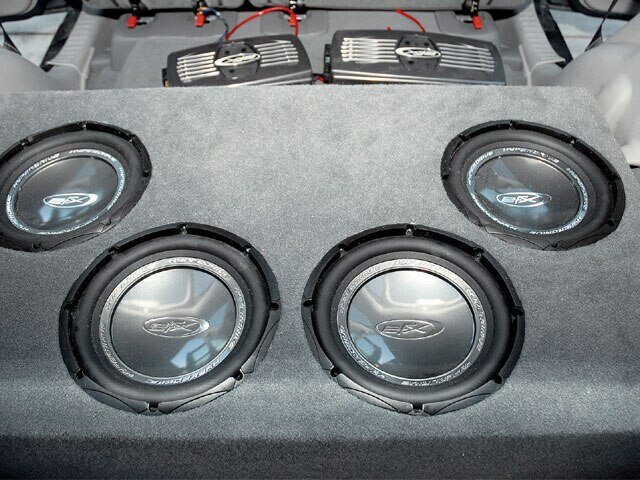 After the enclosure has been finished we can wire and mount the speakers before placing the box into the car. The overall effect of the recess is subtle but it does add a clean finished look. A small basic trim panel was then laid out and trimmed to match the rest of the vehicle to complete the finished look of the rear hatch area. Our job here is done.